This two page ad in 1993 shows off the glorious art of Westwood’s illustrators and the horrifying face of evil looking back at potential heroes. When Westwood and SSI parted ways after Eye of the Beholder II, the studio didn’t leave empty handed. The experience in transforming AD&D into a first-person, grid-based dungeon crawler in two games had also given them the opportunity to flex both their design chops and artists’ brushes giving players atmospheric experiences remembered as among SSI’s best. Now without having to live inside TSR’s worlds, Westwood went out to build their own IP with its own rules, monsters, villains, heroes, and kingdoms with Lands of Lore. Released in 1993 for IBM PCs running MS-DOS and ported to the PC-98 and the FM Towns in Japan, I picked this one up hoping for a solid CRPG. The back of the box had also helped to talk me into it — a Dark Army, a fallen king, and more importantly, my system meeting the requirements to run it. DOS 5.0? Check! 386-16Mhz? Check! Two megabytes of RAM? Check! My 100 megabyte hard drive was ready for another adventure. The game came on eight 3.5″ disks packed into an envelope in a big, white box laminated with little “Virgin” symbols since Virgin Games was the publisher. 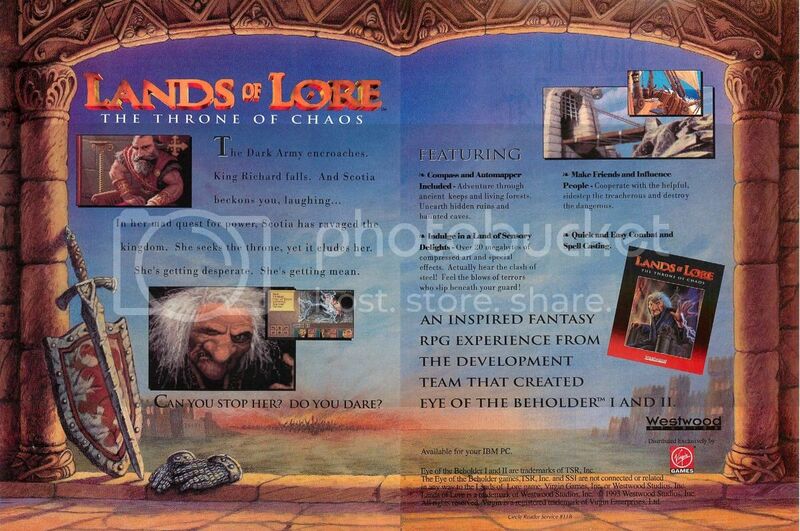 It also included a manual and a booklet setting up the backdrop to the world of Lands of Lore and the events leading up to the present, extras that were relatively common to CRPGs at the time to help immerse players. I was also attracted to this because of another Westwood title — The Legend of Kyrandia: Book One, an adventure game that had arrived the year before in 1992. It featured beautifully colorful graphics, a fairy-tale like story in a whimsical new world, and a strong soundtrack from the renowned Frank Klepacki. Now the company was dabbling in CRPGs and I wanted to see if the same magic would rub off on their newest quest. The “History” book was an embossed, blue covered pamphet that gave a basic background to the “Lands” and the kingdom of Gladstone. There were four races — humanoid lizards called dracoids, cat-like humanoids called huline, humans, and the meditative and mystical, four armed thomgogs who resembled cousins of the Thing from the Fantastic Four. Timeline-wise, the game spoke about the unknown past, a Golden Age when the mysterious Ancients held dominion over all the Lands, the fall of said age and the rise of a dark era filled with legends and mysterious travels, the wars that allowed the four races to ascend above all others, and the arrival of the Dark Army. There was also a bestiary in the back. All of this was written in a tongue-in-cheek fashion that didn’t take itself too seriously as if it was aimed towards newcomers that may have never picked up a CRPG before. Or for those that wanted a break from the more ‘serious’ nature of its peers such as Ultima, Might & Magic, or SSI’s Gold Box series. It was a trait that was also shared with the Kyrandia series, with a nod and wink here and there to remind players to smile while figuring out its puzzles. The “talkie” version came out in 1994, riding the plastic wave of CD-ROMs and delivering Sir Patrick Stewart’s King Richard into PC speakers everywhere. This attitude filtered right down to the gameplay. Unlike the crunch of AD&D brought over to a 3D, first-person world as Westwood implemented in Eye of the Beholders I and II, Lands of Lore dramatically simplified things down to the essential basics with a number of interesting innovations hearkening as far back as FTL’s Dungeon Master in 1987. Some veterans might even feel a sense of deja vu in playing Lands of Lore because of some of the ingredients. Characters only had two “attributes” or ability scores – Might and Protection. Might simply indicates how much damage a character can do with a melee weapon while protection shows how much they actually have to fend off damage. There’s no THAC0 here. The higher the protection number is, the better. Skills boiled down to three gauges – Fighter, Rogue, and Mage. Heavy bashers wanted a high Fighter skill, lockpicking demanded a decent level in Rogue, and spellcasters lived and died by the Mage gauge. Instead of experience, the game eschewed that in favor of actually growing each skill by how much they were used in the game — much like how Dungeon Master did the same thing in 1987. The more a fighter “fights”, the better his fighting skill became. Or if the rogue or mage in the group did the same thing in battle, their fighter skill would also improve over time, too. It was an uncommon system that would later again see use in another CRPG – the Elder Scrolls series from Bethesda. In a way, it was a system that made a lot of sense replacing the abstract progression of a character via experience/skill points with one that more directly impacted growth. You use a skill, you would expect it to improve over time, though efforts by CRPGs such as Might & Magic and SSI’s Gold Box series attempted to mitigate the ‘sudden growth’ of a character using experience tables with the requirement to actually undergo training. For Lands of Lore and its user-friendly approach to an audience that may not have picked up a CRPG before, it struck a solid balance with its simplified mechanics and character management tools. And as another way to soften the hard edged blow of a CRPG or to give veteran dungeon crawlers a break from all of that crunch, players could only choose one of four heroes to start the game with. A cinematic introduction sets things up at the start. King Richard is informed that the leader of the Dark Army, Scotia, is on the verge of recovering an Ancient relic – the Nether Mask. Little do they know is that she already has it in her grasp. Starting the game, players can choose from four champions, each with their own specialties: the Dracoid, Ak’shel whose specialty is magic, Michael whose human blood burns with fighting spirit, Kieran the Huline who is good at dodging blows as the roguish sort he is, and Conrad who is another human that happens to also be the most well-rounded of everyone. NPCs can also join up with your champion — and you can also loot them for gear if yours happens to be a bit underwhelming, they won’t complain, dragging and dropping equipment to the appropriate slots — during your journeys through the Lands. Resting is also as simple as clicking on the tile with the Zs anywhere that feels safe, restoring health and magic points for everyone in the party. Spellcasting is also pretty simple as there are only a small handful of spells which are available to everyone regardless of profession. No one needs to be fed, either. Everything was seen in a 3D, first-person view and a solid automapping system helps to keep track of things for you. Party members and the inventory were positioned below it with a text window sandwiched between them. You could click on the arrow keys to move everyone around or use the keypad instead. Nearly anything seen onscreen could be interacted with. Clicking on stuff will usually elicit a response from your champion, or from someone in the scene. Doors, loot, and many puzzles will also require players to fiddle with things here, especially towards the end. As simple as it is to get to grips with the mechanics (there’s even a glossary at the back of the manual), the game does a face turn when it comes to combat. It’s pretty ruthless especially as things begin ramping up towards the climactic finish with Scotia. Westwood leveraged their creativity from the art right into the monsters giving the beasties special abilities such as being able to disarm the party with a tongue or dissolving armor and weapons. And then it throws a lot of these at you later. Fighting is as simple as clicking on the fight or magic icon for each character in turn — something Scorpia laments in her look at the game for CGW in 1993, wishing that it had that ‘all attack’ option Eye of the Beholder III did in the same year. All character had access to whatever magic was available, the spell list growing by whatever scrolls you can find, and were able to determine the magic ‘level’ that they wanted to cast them at from 1 – 4, the higher levels drawing even more magic points in the process. Because the game uses grid-based movement, veterans from the EoB series might try to use techniques that they’ve used before with visible enemies such as backtracking into corridors, against walls to cover their flanks, or give them distance in order to send missile attacks flying from safety. What Lands of Lore has done is load up on encounters which can gang up on players from the sides or from behind, or in front as a long conveyor belt of bashing death. The welcome mat that the open and simplified mechanics lay out is quickly drenched in monster ichor some time after the introductory quest and when Scotia begins making her move. The Lands aren’t quite as friendly as the visuals hint. However, it was a success for Westwood who would go on to an even bigger and better looking sequel, Lands of Lore 2: Guardians of Destiny, and the less-than-fantastic Lands of Lore 3 where the series ended. Shortly after its release in 1993, the game would also jump onto the CD-ROM bandwagon adding spoken parts of varying quality. Sir Patrick Stewart, on the other hand, hits his part with customary gusto playing King Richard along with enunciating a heroic intro for Virgin Games’ and Westwood’s logos when the game loads up. Today, the game can actually can hold up pretty well especially considering some of the retro-styled efforts being made on the indie side such as Legend of Grimrock’s faithful homage to the grid-based, 3D first-person dungeons of the past. 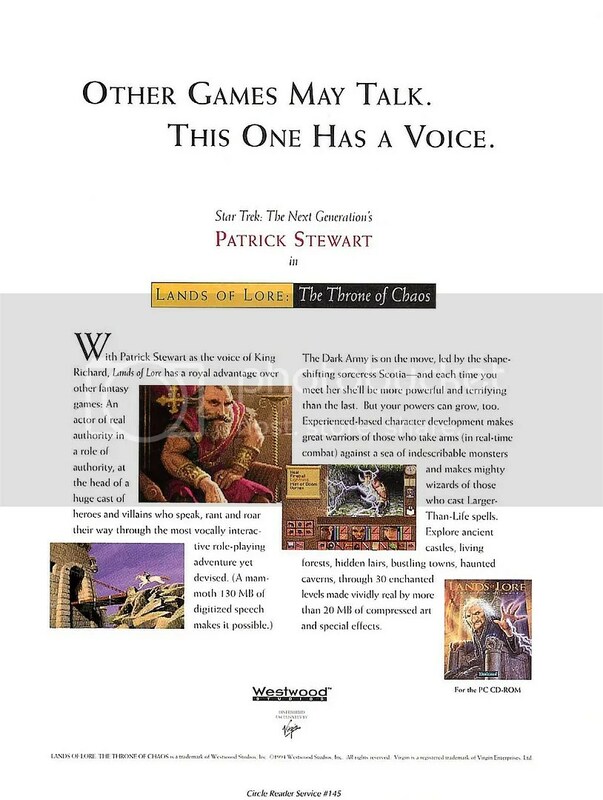 Lands of Lore: Throne of Chaos has also done better than SSI’s CRPG catalog has, appearing on Good Old Games bundled in with the sequel. So if you’re itching for a solid hack ‘n slash, grid-based dungeon crawler dressed in atmosphere, fun visuals, a challenging ending worth getting to, and Sir Patrickt, you might want to answer this call from the past to save the Lands from Scotia’s nefarious evil. ← From the ads of the past, games of yesteryear – Where in the World Is Carmen Sandiego? we need a sequel to this great game. There’s something you don’t mention; was Westwood Studios prohibited from developing Eye of the Beholder 3 because their new owners, Virgin Interactive, forbade them to, or because SSI and Westwood could no longer agree on how to proceed with the series? It seems Westwood pioneered more things than just the RTS genre. People loved Bethesda’s Daggerfall in how it advanced your character’s skills based on how often you used/trained those skills, but I doubt many of them played this game beforehand and learned how Westwood did it first. Still, I think it a real pity that this series didn’t make it to the full 8 entries that the writers planned. I’ve read impressions that it was a difference of opinion, but I think the reason is more because they just couldn’t because they were now owned by Virgin. That’s my best guess after going through a bit of their history which I did some time after for another project after writing this out. From what I’ve been able to gather, at the time in the early 90s, Westwood was being courted by both Sierra and Virgin. Kyrandia was a MUD that they eventually bought the rights to and built a parserless adventure (Legend of Kyrandia) prototype that they wanted to shop to Sierra who, in 1990, demonstrated King’s Quest V to them behind closed doors which…did the same thing. As bad as that sounds, there was some good news: Sierra was interested in bringing Westwood under their umbrella and at the time, as Brett Sperry recounted, they politely said no. Even though Sierra had deep pockets, they also wanted a lot of control which Sperry and Louis Castle didn’t find particularly appealing. They called it Westwood Associates mainly because they felt that everyone in the company was considered an associate and not just an employee. Later, Virgin Interactive had also shown interest in bringing Westwood aboard. The offer might not have been as big as Sierra’s, but they promised to be completely hands off with the company. Both offers were tempting for a big reason — Westwood was getting tired of “betting our home mortgages on each and every title” by putting more of their own money into projects than the publishers would. Back then (and to some extent, it’s the same today), one or two bad titles could have sunk the company. By teaming up with either one, it would be one less headache to worry about, so they eventually went with Virgin’s offer in ’92 with Legend of Kyrandia: Book One being their first title under the new label followed by Dune II (and renaming their company Westwood Studios). After Virgin snatched them up, they likely couldn’t make another EoB game (Assault on Myth Drannor came out in ’93) for SSI since SSI was both a developer and a publisher and because of that, a competitor to Virgin. Hmm . . . “Westwood Associates.” That kind of attitude toward company employees and organization would be pretty difficult to find now, given how gaming went mainstream, budgets and development costs increased, and how risk-averse the whole industry became. But money really does remain the problem in many respects. You might have a great idea, but if you can’t invest the money yourself or crowdfund the project, do you go with a publisher who may or may not share your vision with regards to your project. Not a nice situation, sadly. Thanks again for your very informative replies.